The Bayerische Staatsoper (Bavarian State Opera) is a major attraction for opera fans from all over the world. Here, stage brakes with contactless release monitoring by mayr® power transmission ensure the best possible functional and operating safety - as stage drives have to work reliably during performances. The Nationaltheater (National Theatre) on Munich's Max-Joseph-Platz is the main venue of the Bayerische Staatsoper. With around 2,100 seats, this classical period building is the largest opera house in Germany and is considered one of the most beautiful in Europe. Around 600,000 guests attend around 450 performances per year - operas, but also concerts and ballet events. One component of the Münchener Opernfestspiele (Munich Opera Festival) in the summer 2014 is the performance of Gioachino Rossini's "William Tell". Continuously changing, in part truly spectacular scenes, with steles being raised and lowered on a stage area encompassing around 2,400 square metres place maximum demands on technology during this process. "Around 200 shifts in the elaborately composed stage sets are carried out during the performance using the scenery hoists for the upper machinery. In part, up to 40 axes are simultaneously put into operation," explains Adalbert Schmid, Head of Operational Engineering at the Staatsoper München. ROBA-stop®-silenzio® stage brakes with reliable contactless release monitoring operating behind the scenes and in the scenery and skylight hoists provide the maximum possible functional and operating safety behind the scenes. Reliable release monitoring: On the stage brake ROBA-stop®-silenzio®, each brake circuit is equipped with a contactless proximity sensor. The scenery hoists in the upper machinery, featuring several suspension cables, serve for example to lift or lower stage decorations or lighting units. Load rods are used as load suspension devices. Special safety requirements must be met due to the fact that these scenery hoists often move loads over people, and must also hold or even transport people. The ROBA-stop®-silenzio® safety brakes in the drives have a responsible task: They must save lives in case of an emergency. In case of a power failure or emergency stop, they bring the load rods to a standstill as quickly as possible in order to prevent injury to people or damage to property. "For this, we must be able to rely on the brakes 100 percent: The most important aspect for the operator is to know that their colleagues, the actors on the stage below, are safe", says Adalbert Schmid. "Prerequisite for this is also that the brakes are correctly dimensioned." The dual-circuit brakes work as a redundant brake system and have a braking torque of two times 200 Newton metres in the scenery hoists and two times 500 Newton meters in the skylight hoists. These maintenance-free ROBA-stop®-silenzio® brakes, which are easy to install, are the quietest safety brakes on the market - even after several hundred thousand switching operations. 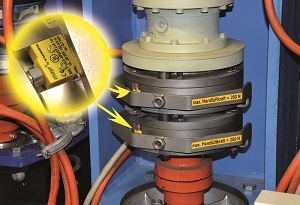 Integrated function monitoring is an indispensable element for safety brakes conforming to the standards according to BGV (German Occupational Safety Act) C1, DIN 56950 and DIN EN 81. This release monitoring prevents unpermitted operating conditions, for example when the motor moves against a closed brake. As a leading manufacturer, mayr® power transmission provides a unique innovation as an alternative to release monitoring with microswitches. A contactless system with an inductive proximity sensor records the operating condition of the brake and issues an enable signal to the motor to start only after release. In spring 2014, the ROBA-stop®-silenzio® brakes in the Nationaltheater were also converted to this system, which provides the greatest possible functional and operating safety. "Our stage drives must function reliably," emphasises Adalbert Schmid. "In a production such as 'William Tell', the decorations are in part moved within seconds, in time with the music, meaning that the backstage technology must run smoothly". Thanks to the precise installation dimensions, the mechanical microswitches which have guaranteed the function of the release monitoring system in the brakes up until now can easily be replaced by inductive proximity sensors. The system with microswitches requires only two lines as NC contact and NO contact. Three lines are necessary for a changeover contact function. The contactless release monitoring always requires three lines for the voltage supply, the earth and the signal. The release monitoring with a proximity sensor is wear-free due to the fact that no mechanical parts are used. The service lifetime is dependent on the switching frequency. Furthermore, the system works absolutely reliably and is resistant to magnetic fields. As there are no moveable elements, and the electronics are completely sealed, it is also resistant to impacts and shocks. Moreover, the inductive proximity sensor is characterised by the high reproducible accuracy of the switch point, the low hysteresis and the minimal temperature drift. The switching bolt for the proximity sensor is factory-fitted, and, unlike the release monitoring with microswitches, is not adjustable. Therefore, application errors due to adjustment of the switching point positions are excluded. It is possible to optionally dimension the contactless release monitoring with a proximity sensor as an NC contact or NO contact function. With an NC contact function, the high signal appears if the brake is de-energised. The armature disk drops and the brake closes. A breakage in the sensor cable is detected when the brake is closed. With an NO contact function, on the other hand, the high signal appears if the brake is energised and the armature disk releases the rotor. The brake is then released. Only with a high signal does the motor then receive the enable signal to start up. This reliably prevents the motor from moving against a closed brake. In this case, the control unit detects a cable breakage when the brake is open.